Dr. Gary Ghiselli, who helped host Murphy Huston’s wife with a back degeneration and the show’s producer Graig Weisbart, guest starred on No Copay Radio April 16th. Common conditions seen in patients with an aging spine. New treatments options (i.e., cervical disk arthroplasty, minimally invasive spine surgery). Why you should consider surgery as the last (not first) option. Whether stem cells are a viable option for spine conditions. His practice philosophy (as an expert in spine surgery). Whether there is credibility to the laser spine institute. I am pleased to announce that I will be returning to Denver Spine Surgeons in October. I value the support and understanding that I have received during my absence and want to thank everyone for their patience during this time. After a lot of thought I have come to the decision that upon my return, I will be restructuring my practice. I have decided to shift the focus of my practice to specializing in the treatment of the cervical spine. The treatment of cervical spine ailments has always been my passion and I feel that this is where my attention should be focused. I will be scheduling new and established patients that require evaluations and surgical consultations for their cervical spine issues beginning October 9, 2017. With regard to my prior patients that were being treated for their lumbar spine, I realize this change may be difficult and I hope to make this transition in care as smooth as possible for you. So I am pleased to let you know that Dr. Okezie Aguwa has recently joined Denver Spine Surgeons and will be available for consultation. (Greenwood Village, CO) August 1, 2017 – Denver Spine Surgeons is pleased to announce that Okezie Aguwa, MD will join the practice and will begin seeing patients on September 5, 2017. Originally from Okemos, Michigan, Dr. Aguwa completed his undergraduate degree at Princeton University and earned his medical degree from Case Western Reserve University. After internship and residency in Michigan at the Oakland University William Beaumont School of Medicine, Dr. Aguwa completed an orthopaedic spine fellowship at the Hospital for Special Surgery/Weil Cornell School of Medicine in New York City. Dr. Jatana, Dr. Ghiselli and Dr. Wong are also fellowship-trained spine surgeons. “Aside from many medical honors and awards, Dr. Aguwa also played Defensive Tackle for the Princeton football team and was the Michigan Division 1 Discus Throw State Champion,” said Dr. Gary Ghiselli. Dr. Aguwa and his wife LeeAnn and are moving to Colorado from New York in August. For more information on the practice or to schedule an appointment with Dr. Okezie Aguwa, please contact 303-697-7463. 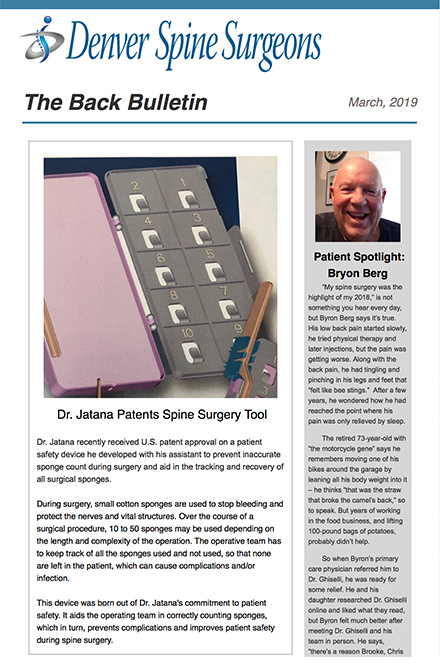 In this issue of The Back Bulletin Dr. Jatana Patents Spine Surgery Tool and Dr. Wong Hits 3 Million United Miles Through Commitment to Spine Surgery Profession. Click here to view the entire article. In this issue of The Back Bulletin learn on How NOT to Hurt Your Back Shoveling Snow This Season. Dr. Wong Speaks at Singapore Orthopaedic Association and Click here to view the entire article. In this issue of The Back Bulletin Dr. Wong Represents NASS in Washington DC and The North American Spine Society and the Japanese Orthopaedic Research Society hold their combined Spine Across the Sea (SXS) clinical and research meeting in Kaua. Click here to view the entire article. In this issue of The Back Bulletin Dr. Okezie Publishes New Study in The Journal of Bone and Joint Surgery and Dr. Wong returns from the International Society meeting in Banff, Canada. Click here to view the entire article. In this issue of The Back Bulletin Dr. Wong Cruises the Persian Gulf with North American Spine Society and the Royal Oman Navy at Arab Spine Conference 2018. Click here to view the entire article. In this issue of The Back Bulletin NASS Announces Dr. Wong as a 2017 Recognition Award Winner. Click here to view the entire article. In this issue of The Back Bulletin Denver Spine Surgeons announces the return of Dr. Jatana to Denver Spine Surgeons and welcomes Dr. Okezie Aguwa to Denver. Click here to view the entire article. In this issue of The Back Bulletin Denver Spine Surgeons announces the addition of another spine surgeon, Dr. Okezie Aguwa, who will start in September and Dr. Wong tackles political healthcare landscape with NASS. Click here to view the entire article. In this issue of The Back Bulletin NASS collaboration extends to the junction of the Blue & White Nile in Sudan and Russell Lundstrom recovers from a BMX biking accident that tore a frontal hernia which essentially shut down his abdominals and forced his back to take on the brunt of his activity. Click here to view the entire article. In this issue of The Back Bulletin Dr. Jantana discusses the condition known as Failed Back Surgery Syndrome. Dr. Wong Receives Lifetime Achievement Award for Advocacy from North American Spine Society and patient Mark Commander discusses his success story after lumbar joint cyst removal surgery. Click here to view the entire article. Denver Spine Surgeons announced that it has enrolled its first patient in a nationwide FDA- cleared adult stem cell study testing novel treatment for chronic low back pain. The study will test the use of Mesenchymal Precursor Cells (MPCs) – adult stem cells derived from bone marrow that will be directly injected into the lumbar disc. The minimally invasive procedure may offer an alternative to back surgery for eligible patients with chronic pain from degenerative discs. Click here to read more about this Research Study. 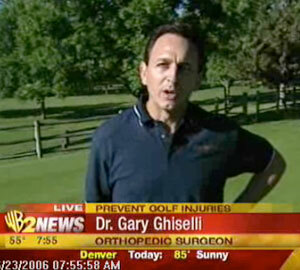 Gary Ghiselli, MD, a board-certified spine surgeon, is a board member of the Colorado Orthopedic Society. He researches problems in the cervical, thoracic and lumbar spine. Dr. Ghiselli also serves as a Guideline Committee Member for the NASS, is a member of AAOS and the Colorado Medical Society. Dr. Ghiselli focuses on anti-microbial substrates, stem cell and regenerative technologies in his research. 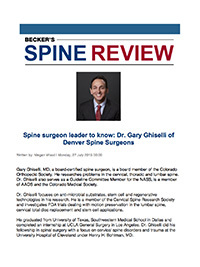 He is a member of the Cervical Spine Research Society and investigates FDA trials dealing with motion preservation in the lumbar spine, cervical total disc replacement and stem cell applications. He graduated from University of Texas, Southwestern Medical School in Dallas and completed an internship at UCLA General Surgery in Los Angeles. Dr. Ghiselli did his fellowship in spinal surgery with a focus on cervical spine disorders and trauma at the University Hospital of Cleveland under Henry H. Bohlman, MD. Please click here to learn more. 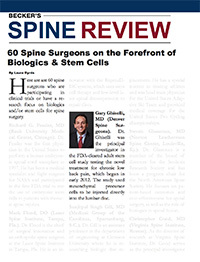 Dr. Gary Ghiselli featured in Becker's Spine Review's "60 Spine Surgeons on the Forefront of Biologics & Stem Cells"
Here are are 60 spine surgeons who are participating in clinical trials or have a research focus on biologics and/or stem cells for spine surgery. Dr. Ghiselli was the principal investigator in the FDA-cleared adult stem cell study testing the novel treatment for chronic low back pain, which began in early 2012. The study used mesenchymal precursor cells to be injected directly into the lumbar disc. Please click here to learn more. 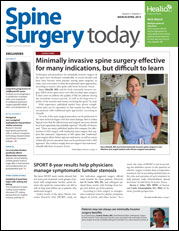 Techniques and procedures for minimally invasive surgery of the spine have developed considerably in recent decades and have since become more popular among spine surgeons, in some cases even more so than the traditional open approaches, according to sources who spoke with Spine Surgery Today. Gary Ghiselli, MD, said he finds minimally invasive surgery (MIS) of the spine more cost-effective than open surgery. It does more to address the quality of life for patients during the immediate recovery period, “as well as the long-term viability of the muscles and tissues overlying the spine,” he said. 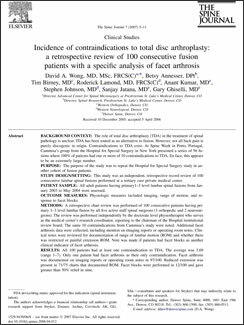 The Executive Editorial Board of The Spine Journal selected Incidence of contraindications to total disc arthroplasty: a retrospective review of 100 consecutive fusion patients with a specific analysis of facet arthrosis written by David A. Wong, MD, MSc, FRCS(C), Sanjay Jatana, MD, Gary Ghiselli, MD of Denver Spine Surgeons as the winner of the first annual TSJ Editors' Choice Award. Click here to download a PDF of the article selected as the top paper among those published in The Spine Journal for volume year 2007 (new window will open). Hear Dr. Gary Ghiselli discuss ways to avoid injuries while talking with news anchor, Tom Green, on the WB2 morning news. Dr. Ghiselli shows audiences various stretching techniques that are necessary to perform before beginning a round of golf.